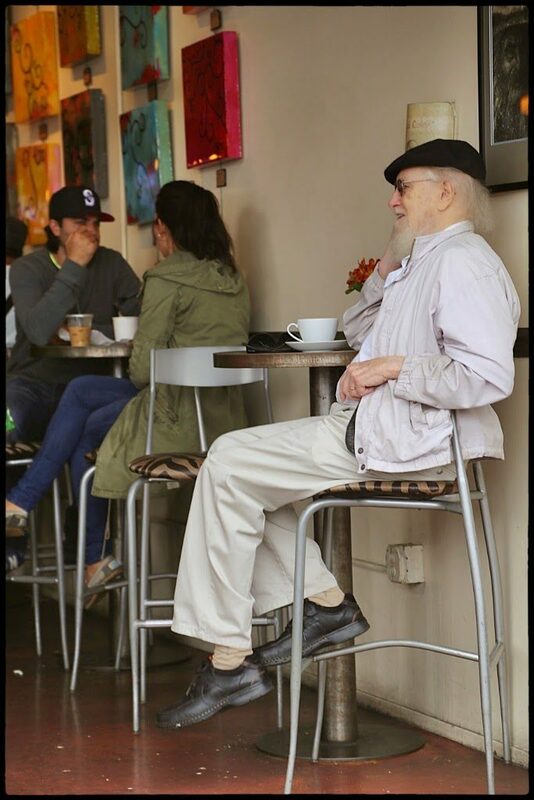 Seattle is known for being the home of grunge music (above all, the band Nirvana), the coffee conglomerate Starbucks and the rain-streaked backdrop to the American version of The Killing. 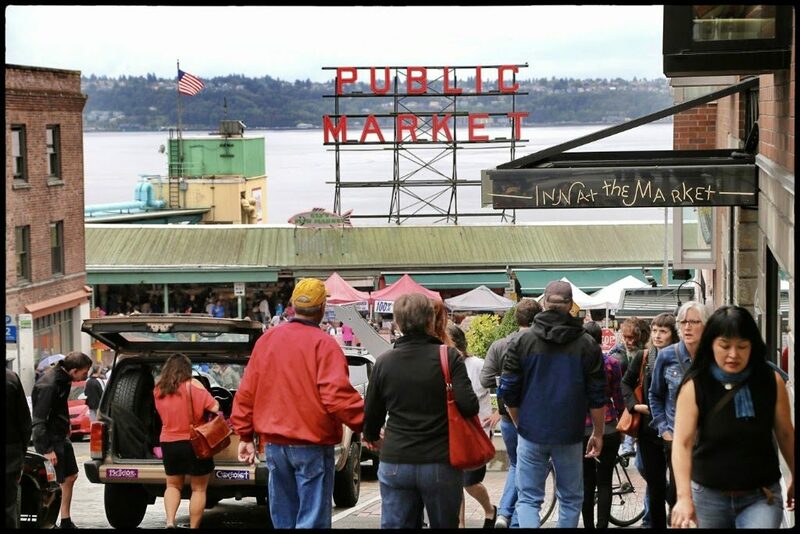 You could say that the Pacific North-West, Seattle and Portland, created the 90s – the music, the look, the nascent foodie culture. Seattle lies next to Puget Sound, the name of this body of water reflecting its proximity to the great Northern seas of Alaska and the Arctic. It’s here you can dig up the science fiction giant clams Geoducks. 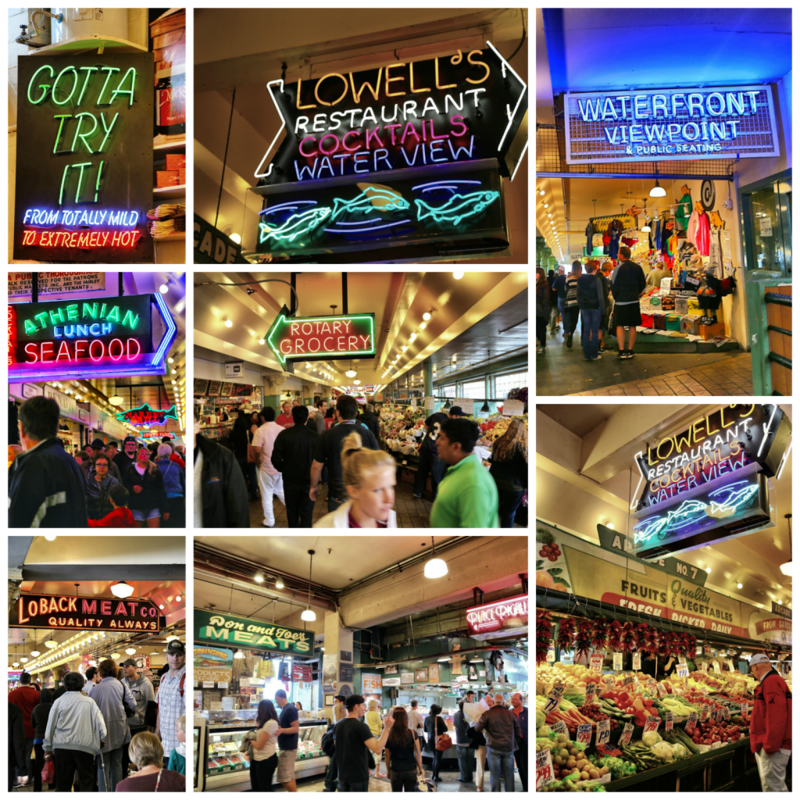 I only spent 24 hours there, en route to Portland from Alaska, but ran around in the drizzle, trying to see and taste everything. I stayed in the area called Fremont, at a trendy ‘hostel’, which felt like a rip-off at over 100 bucks a night. It seems nowadays that if you paint the room black and add a bit of Ikea furniture, you can call your establishment ’boutique’. They didn’t even put the sheets on the bed for me: a couple of sheets, a pillowcase, a thin pillow and a cheap ‘duvet’ with no cover were stacked on top of the mattress. You had to pay an extra 2 bucks for a towel. The staff were very nice, however, which made up slightly for the meanness of the accommodation, a triumph of cool over content. Fremont used to be cheap and bohemian but is now gentrified hipster ground zero with some good places to eat. I ate giant fairy-tale slices of cake, white chocolate with strawberries, at Simply Desserts, tried the gelato at Sirena and scoffed a good tofu bahn-mi sandwich at Lucky’s Pho. Walking around the leafy neighbourhood I spotted a cookbook shop, The Book Larder, which has authors from all over the world doing demonstrations and talks, a cannabis camper van (it’s been legalised in Washington), public -spirited initiatives such as bird feeder style tables with book cases propped on top, outside private houses, anyone can take a book, replace it with another, and portaloos euphemistically christened ‘honey buckets’. 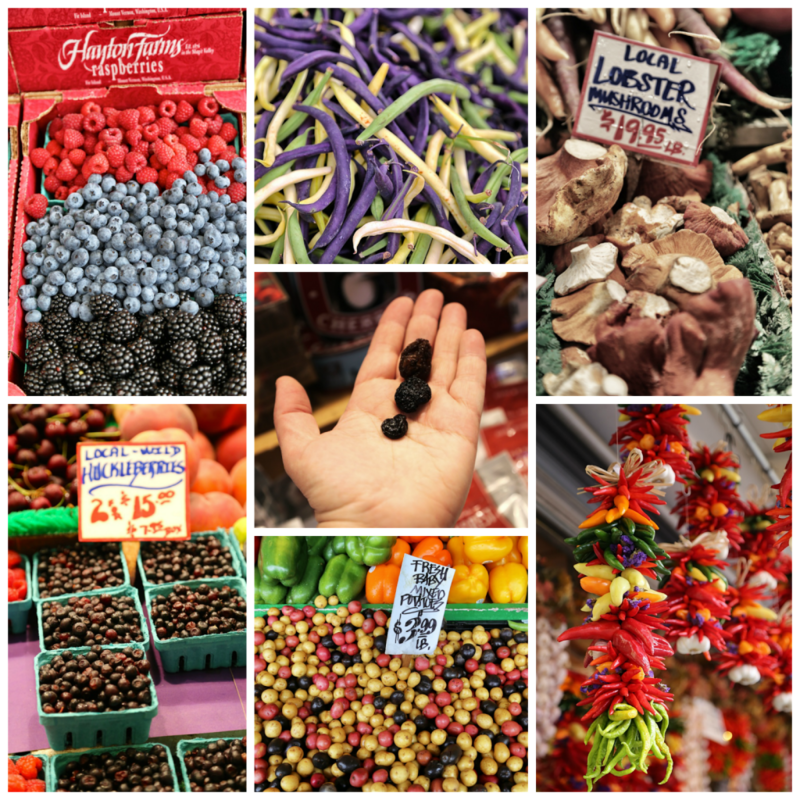 I spent the morning at Pike Place Market in the centre of town. This is where the original Starbucks was born and there were queues around the block, with tourists snapping selfies outside against the logo. Do people really like Starbucks? For my uneducated coffee palate, it serves overpriced bitter weak coffee. 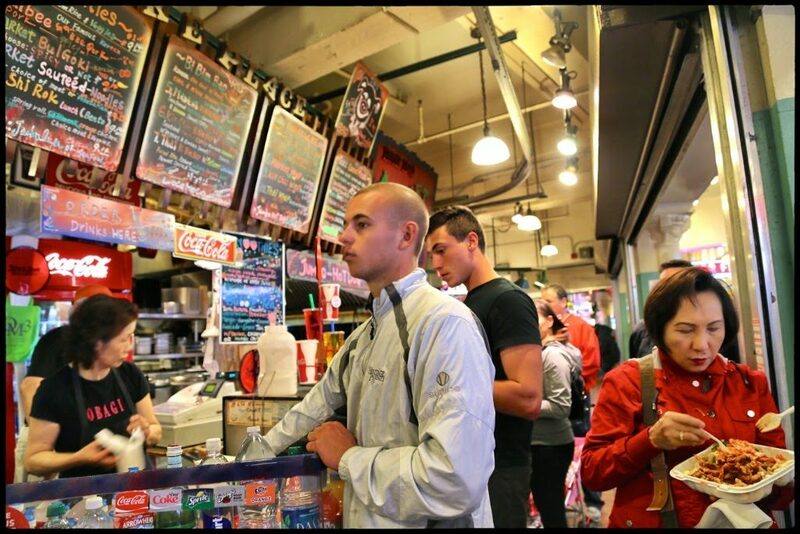 I can only imagine that Starbucks coffee at Pike Place is a damn sight better than it is elsewhere. As this was a rainy Saturday morning, visiting the market verged on the unpleasant, it was so crowded with bustling shoppers. Or, rather, non-shoppers. 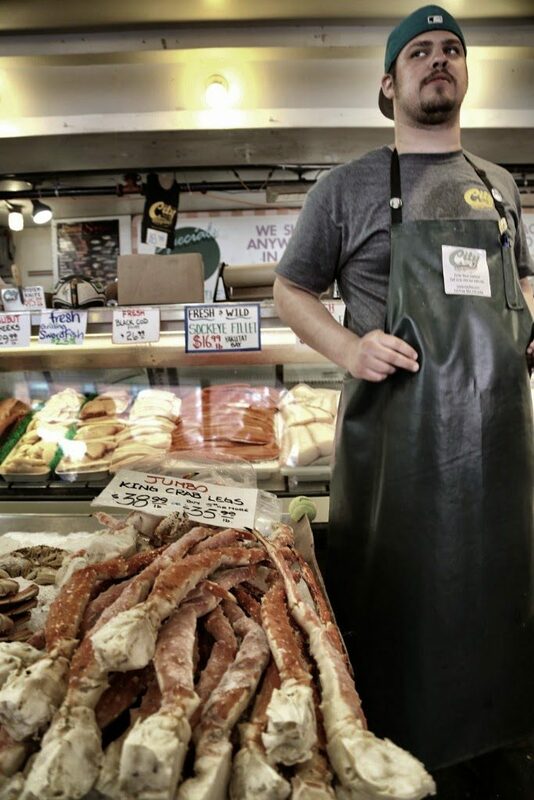 One of the attractions of the fish stall at Pike Place is that the staff or crew do a sort of rolling sea shanty chant every half hour and rather than walk from the front of the icy rows of gawping bug-eyed seafood to the back, a good three metres, they throw the fish to the back. 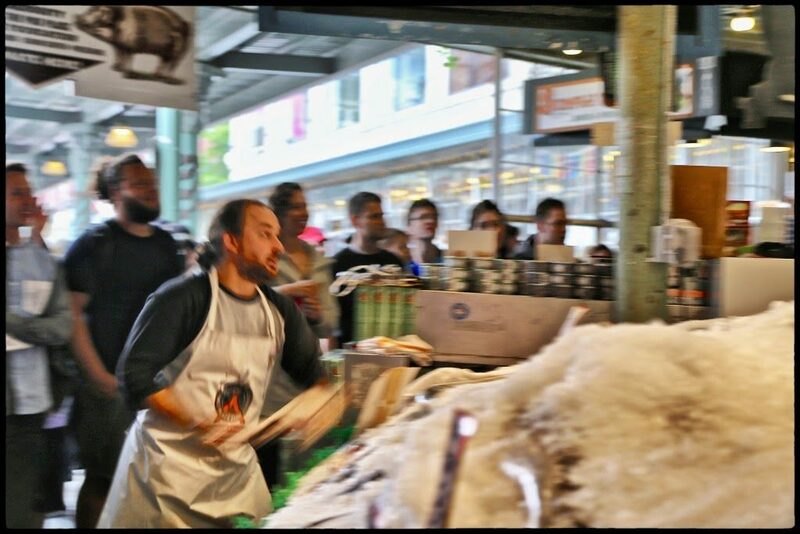 You see the silvery arc of an arms-length salmon being tossed to the guy with the scale, next to the cash register. Hundreds of tourists stand watching them, waiting expectantly for the spectacle to begin, blocking the way of any actual buyer. Every so often a crew member would forlornly ask, “Anyone want to buy fish, anyone? Anyone at all?”. 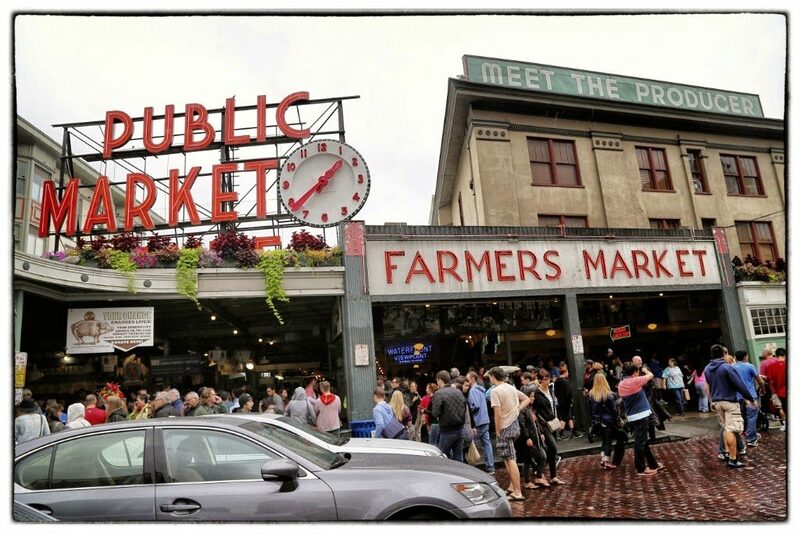 I heard complaints from locals on the tram, when crossing town to get there, that Pike Place market has become a tourist trap (like Borough market in London) rather than a genuine farmer’s market. Nonetheless, it is worth the visit, but, again like Borough Market in London, try to avoid the weekends. I liked the ubiquity of neon signage, it gave a Hopper-like ambiance, a retro glamour to the sprawling walkways of food stalls and restaurants. Inside the market you could buy ingredients and ready-made food if you wanted something to eat. Some of the more established suppliers were in permanent shops around the perimeter of the market. There was a smoked salmon shop, the five types of Pacific salmon sold in wooden cigar-like boxes. You could also buy salmon jerky and the intriguing salmon candy, which I brought home but have yet to try. 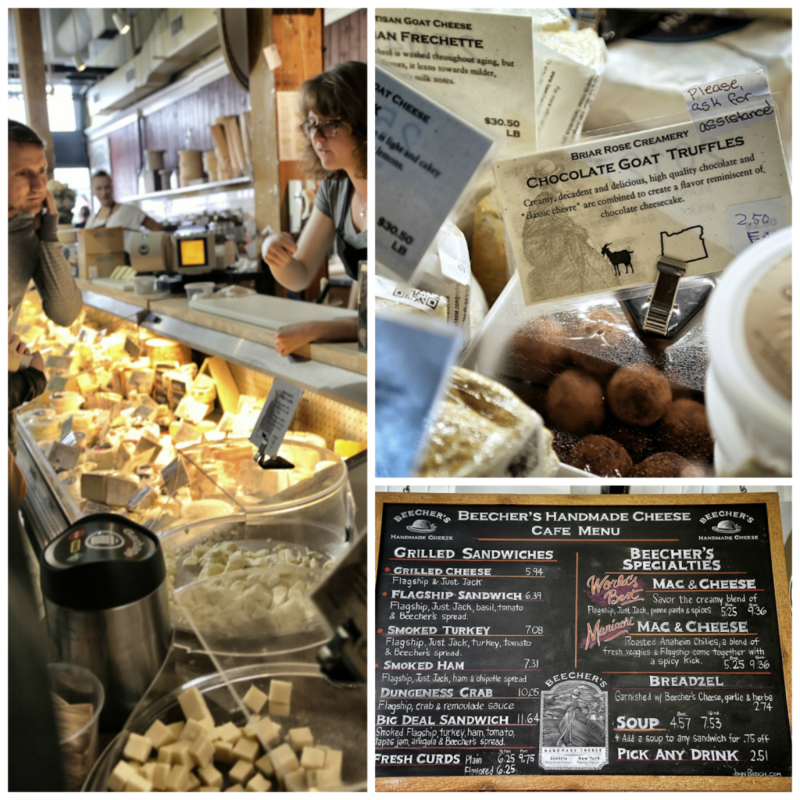 Beecher’s cheese shop had a window where you could watch the cheese being made, the curds being formed in a large metal container while next to it you could order wedges of cheese to take home and hot food such as mac n cheese and grilled cheese sandwiches to eat right there. 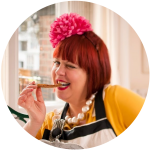 There were lines around the block and I joined them, ordering a rectangle of two toasted sourdough triangles which, when separated, formed stretchy lines of cheese. The sign of a good grilled cheese. I ate cherries, chocolate covered and dried; of differing levels of sour to sweet, trying Rainier, Golden and Black varietals. At one stall, you could taste chilli jams, Scoville levels 1 to 7, I stopped at 5. One guy sold his homemade smoked paprika seasonings, smoked on alder wood, wish I’d bought some. A girl handed out short lengths of dried chocolate pasta for us to taste. A colourful spice shop located on the inside of the market, staffed by dreadlocked, pierced and tattooed youngsters, sold loose powders, dried leaves, teas and ground desiccated berries. Those who know me know I like food on a stick. 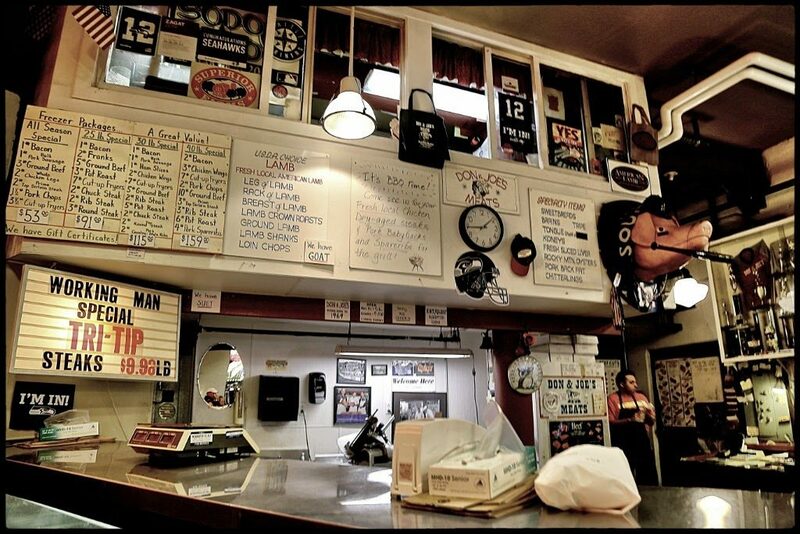 The butchers counter; try the ‘working man special’. Market characters like this guy and another guy, not pictured, who swept past me before I could lift my camera, with a dead racoon Davy Crockett style hat and a live cat curled around his neck like a scarf. There are street buskers to liven up the atmosphere, the white-haired man with no trousers playing a street piano, a jazzy band with double bass outside Starbucks. Lobster mushrooms, cherries, berries and huckleberries. 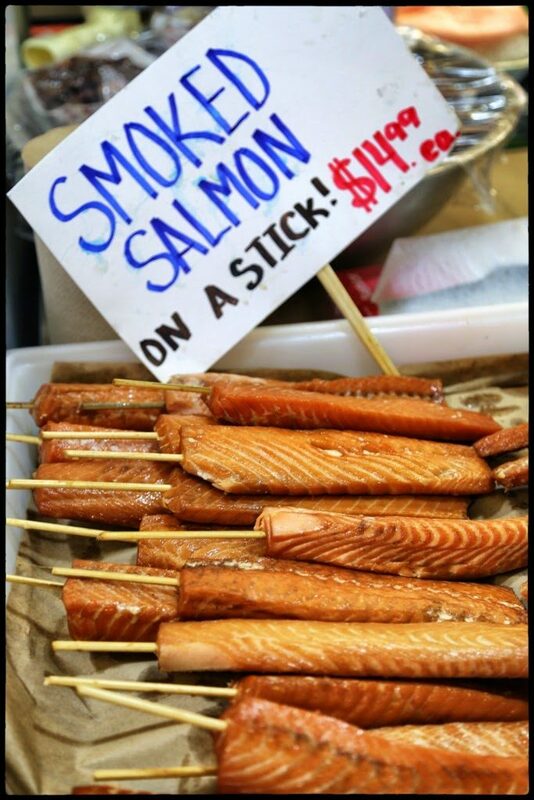 I totally love smoked salmon on a stick. And I really want mac n cheese now, yum. I can imagine that Seattle is reminiscent of Twin Peaks and particularly Lynch-esque at night. Mac n cheese there was great, soft, cheesy and creamy. Seattle was very friendly, a nice city, cultured, not too big. Never seen Twin Peaks but I believe it was set in Washington State.